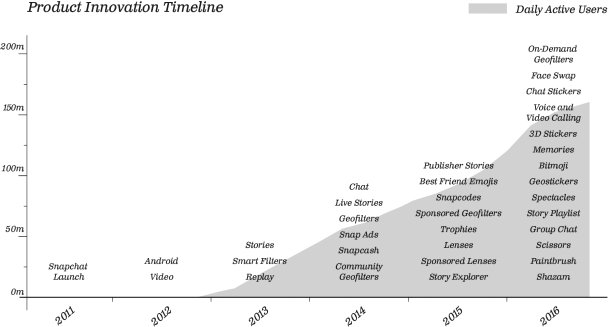 Snap, Inc. is the best consumer software product organization operating today, as measured by the quality and uniqueness of what they ship– which is what counts. What follows is a close-reading of selected passages from their S-1 filing, that show just how unusual they are. Our strategy is to invest in product innovation and take risks to improve our camera platform. I can’t state strongly enough how differentiated this is. No other company who has reached this scale works this way. Their long term differentiation is not based on a classic ‘moat’ but instead on the velocity of product innovation. Snap operates like a toddler running head-first down the gangway. Without momentum, Snap believes it will fall flat to the ground. In other words, Snap doesn’t believe network effects will save them. In our current App Store mobile world, where you can launch a new social app by authenticating it against the address book, network effects are reliant on the value of aggregated historic content, of which Snapchat has very little. This is also why Facebook significantly overpaid for Whatsapp. Any additional friction or slow execution will be quickly rewarded by users leaking to cheaper or more innovative messaging apps. In a world where anyone can distribute products instantly and provide them for free, the best way to compete is by innovating to create the most engaging products. That’s because it’s difficult to use distribution or cost as a competitive advantage — new software is available to users immediately, and for free. We believe this means that our industry favors companies that innovate, because people will use their products. This is true, but I believe the conclusion is wrong. This effect actually favors the incumbent. Internet-connected software can be retroactively bundled, meaning new features can be brought to existing userbases. Instead of requiring a new app, Snapchat can add filters that are just a swipe away. This is good for Snapchat compared to upstarts, but bad when Instagram and Facebook can do the same starting with larger numbers of users. After years of slow execution, Instagram has finally turned on their Xerox machine and aimed it at Venice Beach, copying features like the Story and the disappearing message. Early on, we thought about charging our community to use additional features. For example, we saw so many people having fun with the Creative Tools we made, like drawing and captions, and we thought people might want to purchase additional ways to express themselves. To test this hypothesis, we built a Lens Store where our users could buy new Lenses, in addition to the free ones we already provided. The results were disappointing. Only a small number of people wanted to buy Lenses, and the number of people using Lenses decreased. After a few weeks, we got rid of the Lens store and made all of the Lenses available for free. Almost immediately, our community began to use Lenses more and create more Snaps to send to their friends and add to their Story. Additionally, our products often use technologies that demand a lot of processing power and don’t work as well on lower-end devices, like the technology behind Lenses. This means that unlike many other free mobile applications, the majority of our users tend to be located in markets with high-end mobile devices and high-speed cellular internet. We have found that these markets are also less expensive to serve because our cloud infrastructure partners typically have better performance and cheaper bandwidth in these countries. As such, our costs tend to be lower in these markets. This is also a rather remarkable choice. Because the features Snap wants to deliver aren’t widely accessible in developing markets, Snap admits they won’t be competitive there. Another company would create a low-end version of their product to take global market share. But Snap would prefer to wait for these markets to come to them. This also highlights Snap’s massive computing costs. Just a few days ago, Snap signed a contract with Google Compute Cloud, requiring them to pay at least $400 million a year for the next five years. There is some debate about whether building out their own infrastructure would have been more cost effective. I don’t know. But it is worth noting that the ability to outsource infrastructure is precisely what enabled Snap to build so quickly and scale with a fairly junior team for so long. Snapchat was built on top of Google’s App Engine, a so-called “platform as a service” that abstracted many of the technology decisions a company had to make if it launched just a few years before. This point underlies Snap’s fear of competition, because they are completely aware that the advantage now lays with those who innovate with a deep understanding of users rather than who rely on scale and expertise as an advantage. The next $25 billion company might have a single engineer.